During May we hosted a posture clinic focusing on a few things you can bring into all of your postures. One of the postures we discussed is the half moon pose. 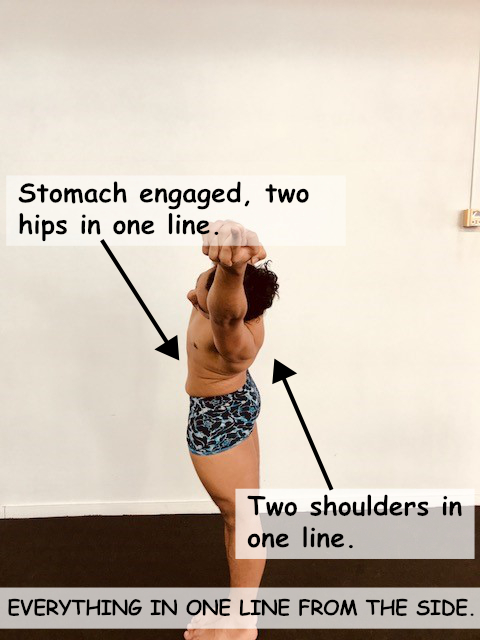 This pose may appear quite simple and easy but can cause a lot of grief if done incorrectly. It is so important to look after your joints and spine and this posture can be the start of something really great. Below we have a couple examples of Half Moon done incorrectly and an example of what it should look like. If you need any help with this please come and see your teachers. The front and back of the body need to be used equally to ensure a full body stretch “fingertips to toes”. 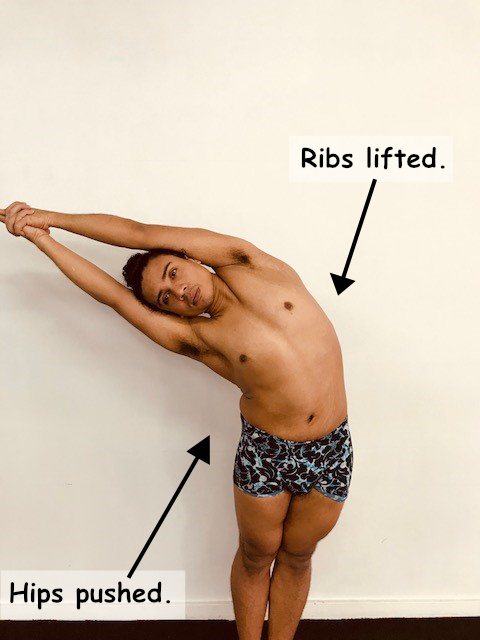 Your ribs need to lift up rather than out, and your hips need to push past your usual range of motion. See below. The front facing pictures look relatively the same but from the side differ greatly. Keep an eye on your alignment for maximum benefit. In addition to discussing postures we touched on how precise the human body set up really is. If you pay attention to the shapes within your body your postures will start to make more sense. 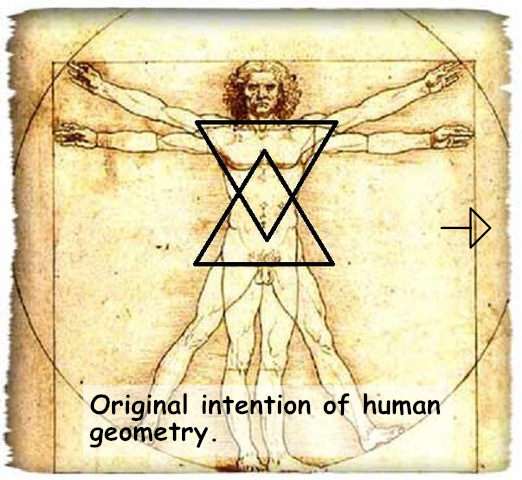 In the human energy system there are two major triangles, one facing up and one facing down. When we eat too much food and sit down for too long the upward facing triangle becomes a lot smaller and the downward facing triangle becomes overbearing. 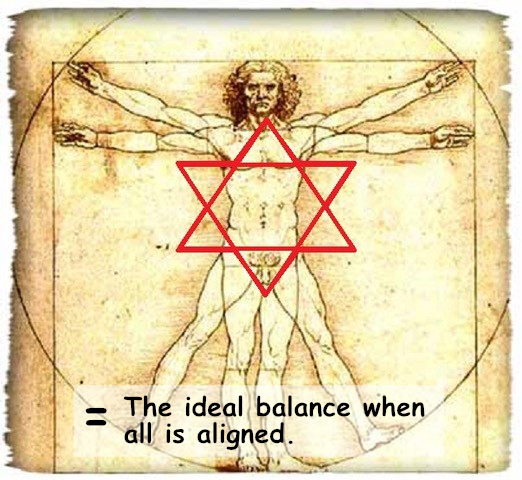 With yoga practice and good movement, eventually these two triangles merge and end up creating six equilateral triangles. In yoga terms, this is called chakras or Nadi energy systems. 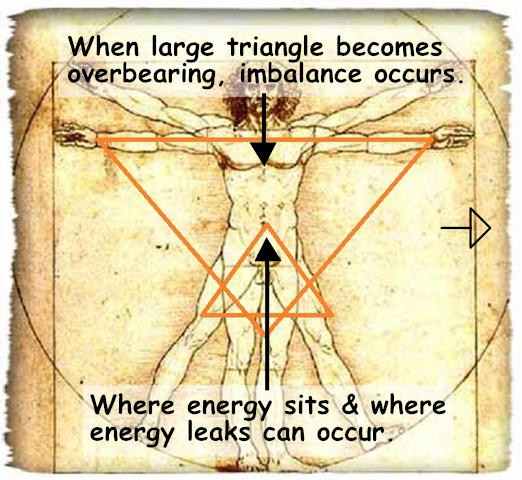 The majority of energy sits within this lower triangle and without proper use of stomach muscles in your postures “energy leaks” occur. 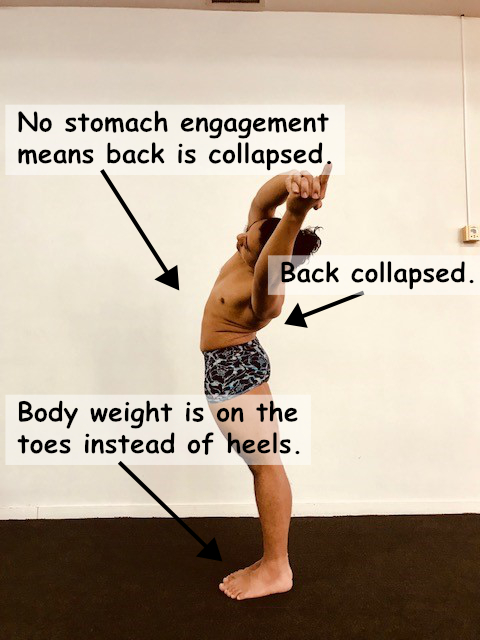 You should leave class feeling energised, not fatigued, engagement of the correct muscles will leave you with a supported pelvis and lower back. 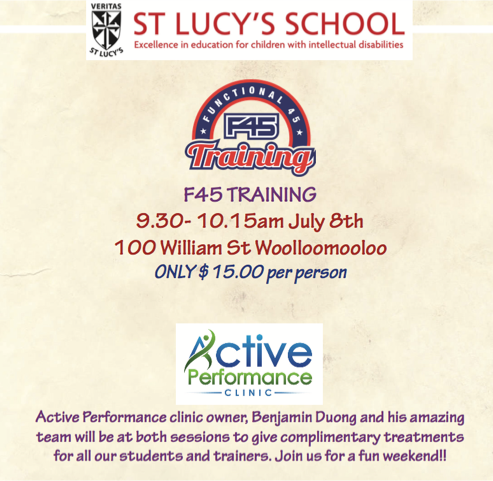 On the first weekend of July, F45 Training Woolloomooloo and Bikram Darlo are joining forces for a good cause. If anything it will be a good laugh to watch Katie lift some weights. The F45ers will be joining us in class the day before as well. We need to confirm numbers as they will be holding a class especially for Bikram Yoga Darlinghurst members. All proceeds will go to St Lucy’s school for intellectual disabilities where Katie’s nephew currently attends. Click here to sign up for this fun event. We do not need a reminder that winter is here for the next little while, but that does not mean your Bikram practice has to suffer. If you remember last year, the flu hit hard and the hardest part was getting back into the hot room. It is highly recommended that you guys keep up your practice to keep your core temperature balanced which in turn will make it less likely for you to pick up what is going around. Without a doubt, if I (Katie) take more than 4 days off at this time of year, it is almost a guarantee that I will get sick. Tying into this time of year as well, is looking out for each other in and out of the hot room. Please if you need to use tissues, wrap them up in your towel. Leaving them on the floor ensures somebody else has to pick them up. Please wash your hands after using the bathroom and be sure to spray your mats down with the mat sprays we have available. If you are sick, please stay at home and join us when you start to feel better. In other words, mindfulness. We thank you in advanced for this small gesture and hope to have a healthy and happy winter. If you are on social media, a like, a follow or a check in is much appreciated. We have the BEST community and we want more people to be a part of it. If you are on the Ezidebit membership you can gift a class to one of your friends each month as well. We look forward to seeing you all in the hot room this June, July and August.